With over 30,000 units handling tough duties worldwide, Compabloc is the market champion when it comes to heat transfer. Laser-welded construction offers superior reliability in duties with aggressive media and high pressures and temperatures. Compabloc also offers 3-5 times the thermal efficiency of traditional shell-and-tube solutions, with a more compact design that is much easier to install and service. 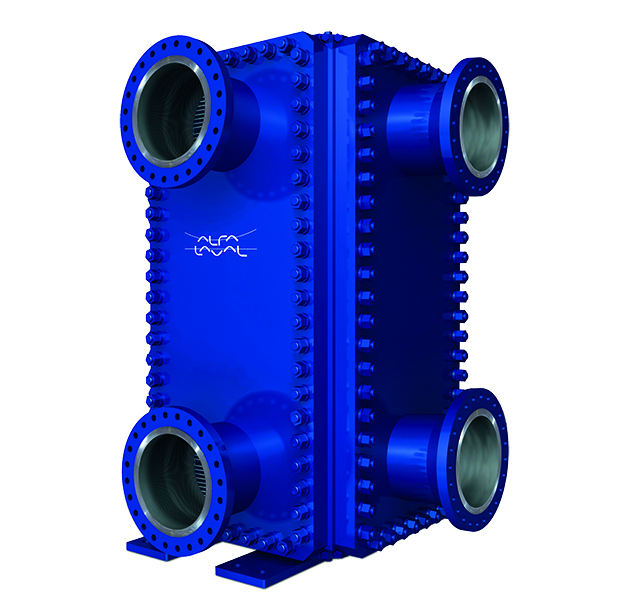 Alfa Laval Compabloc is a proven solution for efficient heat transfer in duties with tough media, pressure or temperature demands. It also comes with the backing of the only supplier with deep process knowledge and a global network of experienced experts. Energy-efficient and reliable technology, along with a partner you can count on for the long haul – that’s how you improve sustainability. People choose Alfa Laval Compablocs for one simple reason. They just work, and more than 30,000 units delivered is the proof. Our proven manufacturing and technical solutions lead to high reliability and a long working life. Many Compablocs that have been in continuous operation for decades are still delivering peak performance. Compabloc’s high thermal efficiency leads to higher heat recovery, lower boiler fuel consumption, and reduced CO2 emissions when Compablocs are used for heat recovery. Minimized fouling allows Compabloc to operate with cleaning intervals substantially longer than traditional heat exchangers, reducing lifetime maintenance costs. It is also the only welded heat exchanger where all channels, both hot and cold, can be fully cleaned using a hydro jet, bringing performance back to 100% after every cleaning. Bottlenecks related to heating or cooling can often be resolved with more efficient heat exchangers. The compact size of a Compabloc enables you to pack much more performance into the same space, or free up space for other types of equipment. It also means lower installation costs. High energy efficiency combined with low installation and maintenance costs means Compablocs offer much shorter payback times than other technologies, such as shell-and-tube or other types of welded plate heat exchangers. The equipment often pays for itself in a matter of months. Compabloc is available in a wide range of sizes and is custom made to fit the specific operating and installation conditions. It can be made in virtually any material that can be pressed and welded. Compabloc’s short flow path and large cross-flow area ensure low pressure drop and high efficiency, making it ideal for condensing duties. High heat transfer rates and low fouling, make Compabloc the best choice for long-term efficiency and consistent performance. As a result, Compabloc performs condensing duties 2-4 times more efficiently than traditional solutions. Vapour enters from the top of the unit and condenses on the cold plates as it passes through the plate pack, with condensate exiting at the bottom. If the vapour contains non-condensable gases, Alfa Laval can design a two-pass arrangement on the condensing side that permits gas/liquid separation inside Compabloc, eliminating any need for a separator unit. Condensation takes place primarily in the first pass. Sub-cooling of non-condensable gases is achieved in the second pass, which also serves as a mist eliminator. Performing at 3 to 5 times the efficiency of shell-and-tubes, Compabloc is perfectly placed as a liquid-to-liquid heat exchanger (heater, cooler or interchanger). With the ability to handle crossing temperatures in a single unit, and a temperature approach as close as 3°C (5.4°F), Compabloc offers significant energy saving possibilities. Compabloc also handles asymmetric flows with ease thanks to its flexible flow configuration. Since this lightweight unit is installed vertically, installation problems are instantly solved. High thermal efficiency, compact size, low static head, minimum fouling and easy cleaning make Compabloc the perfect reboiler. It can be used as a thermosiphon or forced circulation reboiler. Compabloc makes it easy to increase reboiler capacity, offering up to double the capacity of a traditional heat exchanger of the same size, and reducing the installation costs of the distillation tower. The compact size means the hold-up volume, and residence time, is very low compared to a traditional heat exchanger, reducing thermal degradation of the fluid. This makes starting the process quicker, with lower cost for out-of-spec process fluid. Sitting at the core of every Compabloc is a stack of corrugated heat-transfer plates made of stainless steel or other corrosion-resistant materials, laser welded alternately to form channels. The hot and the cold streams flow through alternate channels. Corrugated plates cause high turbulence, resulting in substantially higher heat transfer efficiency with a 50–80% smaller heat transfer area than comparable shell-and-tubes. Flow turbulence also reduces the build-up of fouling. The Compabloc’s unique plate design eliminates dead zones in the heat exchanger. The two flows in a Compabloc can be configured as single pass, or as multiple pass by using baffles. The number of passes on the hot and cold side can be chosen independently, making it possible to optimize heat transfer even if flow rates on the different sides differ greatly. This unique flexibility means the Compabloc is always optimized for exactly the required duty. The baffles are made to withstand full vacuum, and can be rearranged if design conditions are changed in the future. Compabloc units have a counter-current flow and can operate with a crossing temperature program (in a single unit), where the temperature approach is as close as 3°C (5.4°F), maximizing energy recovery. The small size and light weight makes it possible to install Compablocs anywhere, for instance at the top of distillation columns or suspended from support structures.